Commercial goods Transportation insurance industry has always been dependent on a time consuming and man hour intensive process of insurance cert verification. 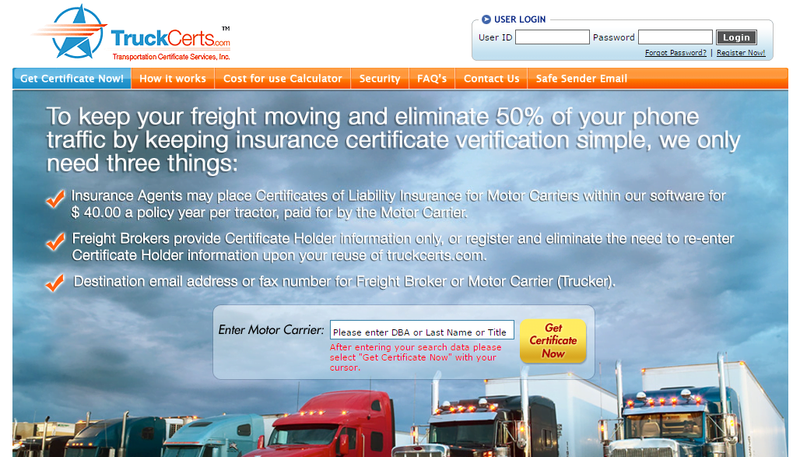 Freight brokers request certification for the motor carriers from their respective insurance agents and the agents manually fax these over, this process is repeated for each load thousands of times each day across the United States. The challenge was to build a system that would streamline this process to offer an easier, automated and environmentally friendly alternative. The solution should not only be easy to use it needed to be 100% secure as this was a sensitive insurance application dealing with policies with millions of dollars of potential liabilities. Security, Stability and Scalability were paramount, the application was expected to manage thousands of certificates per day with hundreds of thousands of certifications in the database at any point of time. Pulse engineers proposed a solution using the power of the Internet and the Portable Document Format or PDF. The system is simple but at the same time extremely powerful and versatile. Certificates are saved into a protected encrypted database management system and generated on a fly for each Freight Broker using the PDF format, the pdfs generated are protected from tampering as well. 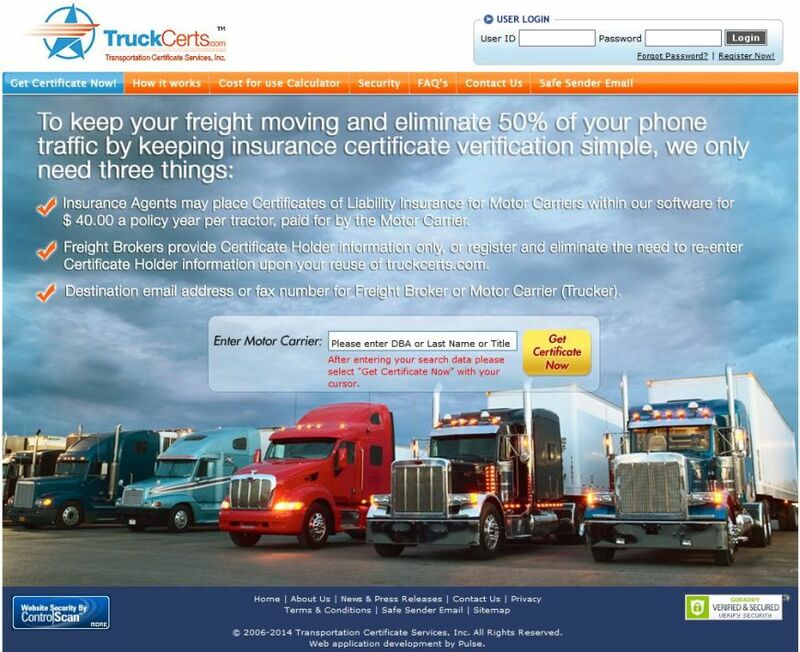 The solution can process tens of thousands of certificates each day, certificates are generated upon requested and dispatched immediately to the verified email address of the freight broker, the freight broker needs no additional configuration or steps at all. Security is multi tire, each Insurance company and / Or Managing general agent can configure their accounts specifically to the hierarchy and authority that prevails in their specific organizations. Field level security ensures the access rights can be perfectly matched to the agent’s individual needs and privileges. An intuitive billing system means adding thousands of certificates can be cost effectively and easily accomplished using any industry standard import process. A process that works beautifully and has the potential of saving thousands of man hours and tens of thousands of dollars in wasted paper annually. The system has been proved beyond doubt to be the answer that the transportation insurance was looking for. The response from the industry has been excellent; users see the benefit of the service immediately and appreciate the simplicity provided. 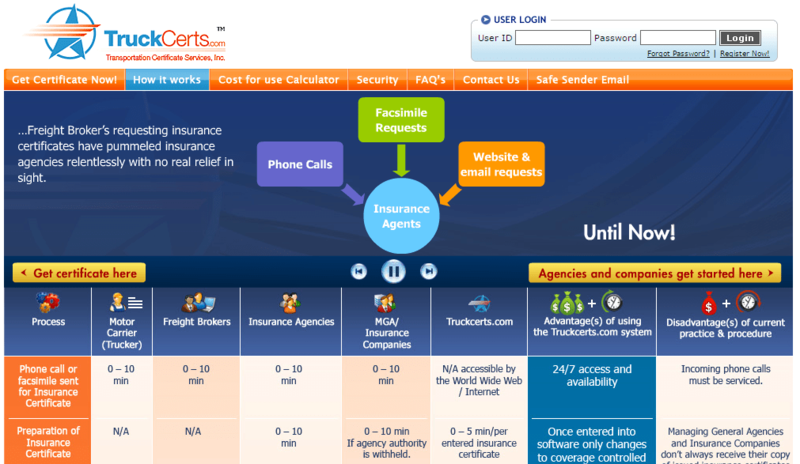 This service is well on its way to redefine how the Transportation insurance industry functions. Several large insurance companies and agents have signed up and the service now hosts a huge database of protected insurance certificates that are easy to enter, maintain, access and send to any part of the world in a few seconds over email. This is one of the proudest achievements of the Pulse team and we religiously support the service to ensure the software keeps up to the growing needs of its users.